Realtime Gaming's Triple Twister went live today, July 16, 2014, on mobile devices through Desert Nights Casino and Slot O' Cash with amazing promotions going hand in hand with the launch. 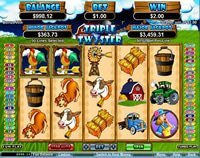 This great five reel, 50 pay line slot has seen success on the desktop site already and is shaping up to do even better with the mobile gaming crowd as the 17th video slot added to their mobile platform powered by Realtime Gaming. These high quality games are available for users on phones and tablets for both iOS and the Android operating systems. Mobile players in the United States market can reap the rewards of this new release by using the coupon code MOBILETWISTER in order to claim ten free spins to play Triple Twister on either Desert Nights Casino or Slot O' Cash. This offer started on July 16th, 2014, at 12:01am EST and is set to end at 11:59pm EST on July 17th, 2014. Once the coupon code has been redeemed, this bonus for Triple Twister can be used by selecting the game from the app's main lobby. The only trouble may be choosing which site to play through as both offer a broad selection of offers that make it easy to start spinning with huge deposit bonuses added on for new players across several tiers. The variety of choices for both gives great incentives for new players as well as huge boosts to those who roll into the digital casino with their bankroll ready to play all day. Deserts Night Casino's options includes a staggering $8,888 welcome bonus that rolls out across six tiers, specifically for use on the many slot machines available. Using the coupon code DESERTMATCH1 to get a 200% match up to $1958, DESERTMATCH2 for a deposit match up to $1500, DESERTMATCH3 for 150% matched up to $1500, DESERTMATCH4 for 150% matching up to $1500, DESERTMATCH5 to match at 122% to $1220, DESERTMATCH6 to claim a 121% match up to $1210. This ties in with an $8 no deposit bonus when the coupon code 8FREEPLAY is used. Meanwhile, Slot O' Cash has an amazing selection of deposit bonus for players of all experience levels, such as their huge five tier $7,777 deposit match for use exclusively on slot games. Coupon code SLOTO1MATCH gives a 200% deposit match up to $1500, while SLOTO2MATCH, SLOTO3MATCH, SLOTO4MATCH all give 100% deposit matching up to $1500, and SLOTO5MATCH has 177% matching limited at $1777. Until the end of July 2014, the first coupon codes gives ten free spins.